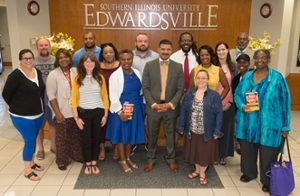 As part of his life’s mission to make education and college accessible to those who need it most, Dr. Steve Perry, highly sought-after black educator, author and speaker, spoke at the opening ceremony of the Southern Illinois University Edwardsville East St. Louis Charter High School (CHS) Teachers Institute on Monday, Aug. 7. Perry, educational “revolutionist” for African American students and founder and principal of Capital Preparatory Magnet School in Hartford Conn., brought his impassioned message to the Charter High School. More than 100 people from the SIUE and East St. Louis communities, and surrounding St. Louis Metropolitan area, crowded into the Multipurpose Room at the East St. Louis Higher Education Campus to hear Perry, according to Gina Jeffries, CHS program director. African American students perform best when they know they are loved and are in an environment where there is order and expectations, Perry told the crowd. Perry also proudly informed the audience, which included SIUE East St. Louis Upward Bound students, that he was once an Upward Bound student, and it provided him with valuable tools and added to his educational drive. Perry imparted hope and effective teaching strategies to CHS faculty, according to Jeffries. To the students and parents, the educator communicated a desire to achieve against all odds. The SIUE Charter High School is a school-of-choice for families in the East St. Louis School District 189. The mission of the Southern Illinois University Edwardsville East St. Louis Charter High School is to prepare students who are career- and college-ready upon graduation. To achieve this mission, the school and its staff will positively impact the educational and economic lives of East St. Louis, Illinois youth through individualized instruction in core academic subjects, exploration of career interests and aptitudes, assistance in realizing students' talents, high academic goals, and expectations that graduates will become competitive employees for the 21st century. 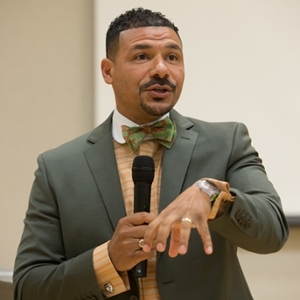 Dr. Steve Perry, highly sought-after black educator, author and speaker. Dr. Perry, center, with the staff and administration of the SIUE East St. Louis Charter High School. Edith Laktzian, center, (CHS faculty associate) and D. Marcheta McCoy, right, (CHS office support associate) hold one of Perry’s books: Push Has Come to Shove: Getting Our Kids the Education They Deserve – Even If It Means Picking a Fight.